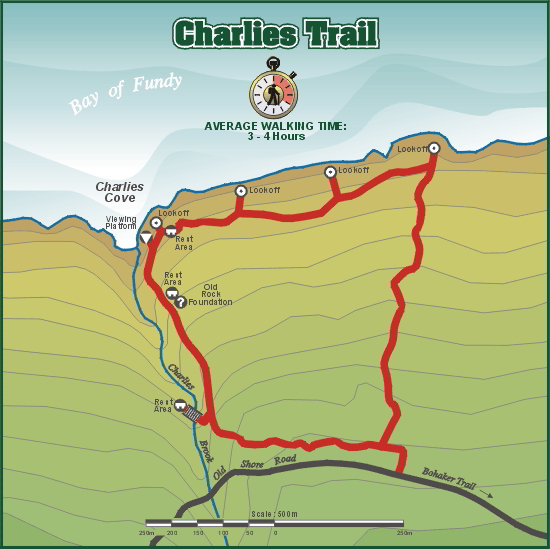 One of two trails making up the Delaps Cove Wilderness Trail, the hike to Charlies Trail and return will take approximately three to four hours, and it will follow the Old Shore Road, an abandoned provincial road. Visitors are advised that some logging does occur on private lands between the two trails. The trail entrance is located west of Sloan's Brook and before Charlies Brook (see Key Map). The viewing platform at Charlies Cove provides views of the Cove, and from this location you might be able to catch a glimpse of the Digby-to-Saint John ferry crossing the Bay of Fundy. The trail passes along the foundation of the Pomp homestead, which may have sheltered as many as ten people, as homes were small and families large. The majority of ground cover on Charlies Trail, besides the ferns (Cinnamon, Long-Beech and Bracken), is composed of smaller, less conspicuous plants, such as the shiny, three-leafed Goldthread. Early settlers used Goldthread to soothe mouth and throat pain. Bayberry shrubs and bunch berries can also be found along the trail.